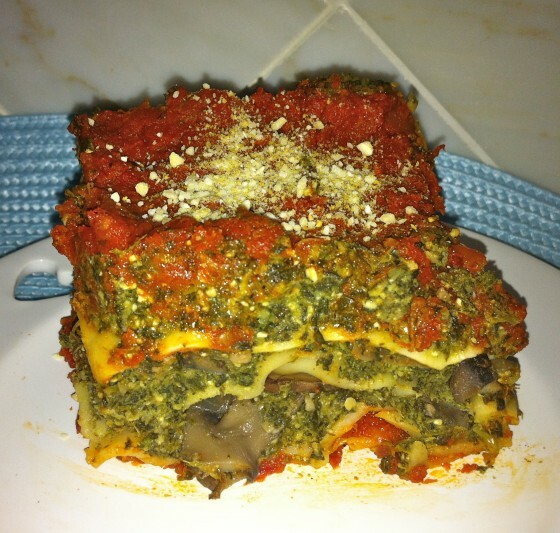 Do you love lasagna but think that a vegan lasagna couldn’t possibly hold a candle to traditional meat or even vegetarian lasagna? You can have a satisfying and delicious lasagna and never miss the meat or cheese that seem to define lasagna for omnivores! My friend, Natalie, gave me this recipe which she adapted from celebrity Chef AJ, a wonderful and inventive creator of great, healthy food! Every time I make it, my daughter eats the leftovers for every meal until it’s gone. Then she begs for more. My friend Annice, a gourmet cook, remarked that she actually liked it better than vegetarian lasagna with cheese, when I served it at a small luncheon. This dish has a bit of a pesto-y zing to it and you’ll realize that cheese or meat are just not necessary to get that flavor! 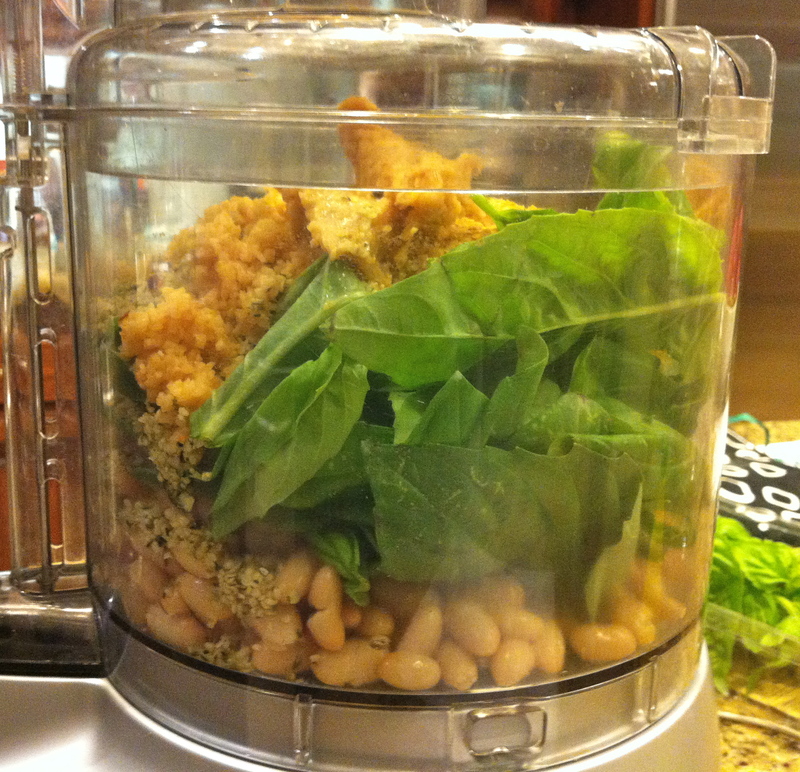 1) In a food processor, add the beans, basil, hemp seeds, 3 cloves of garlic, miso paste, nutritional yeast, lemon juice and pepper flakes. Puree until smooth. 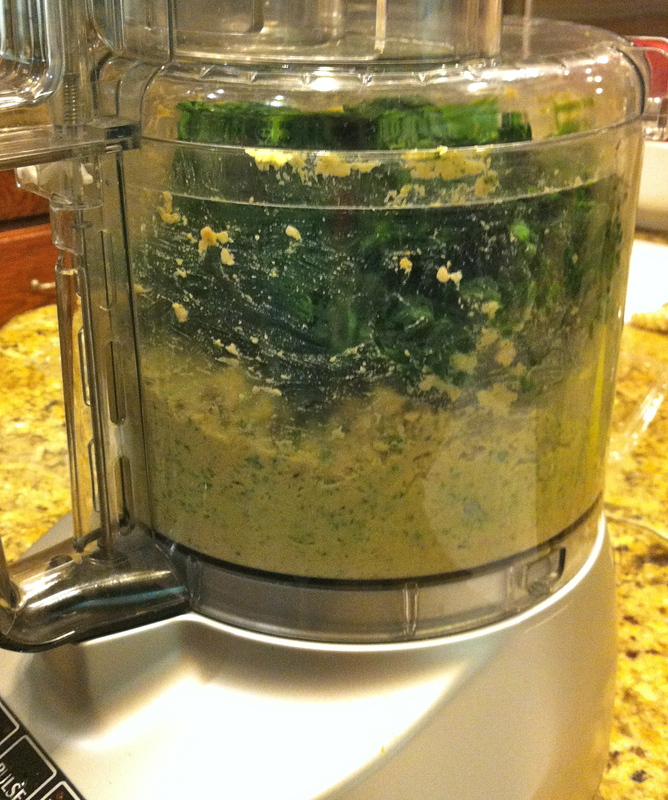 2) Add the spinach and puree again. Set aside. 3) In a large saute pan, saute the onions in 2 tbs of water until translucent, about 8 minutes, adding more water when needed. 4) In the saute pan, add 1 clove of garlic, the mushrooms, and the tamari (soy) sauce and saute until golden brown. 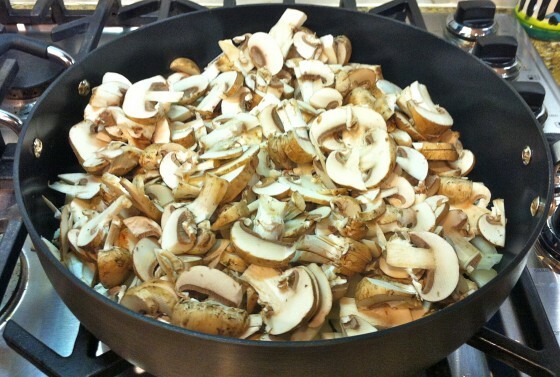 Cook until mushrooms look glazed and no liquid is left in the pan. 5) Pour 3 cups of marinara sauce into 9 x 13 lasagna pan. 6) Place 1 layer of no-boil lasagna noodles on top of sauce. 7) Cover the noodles with about 1/3 of the spinach mixture. 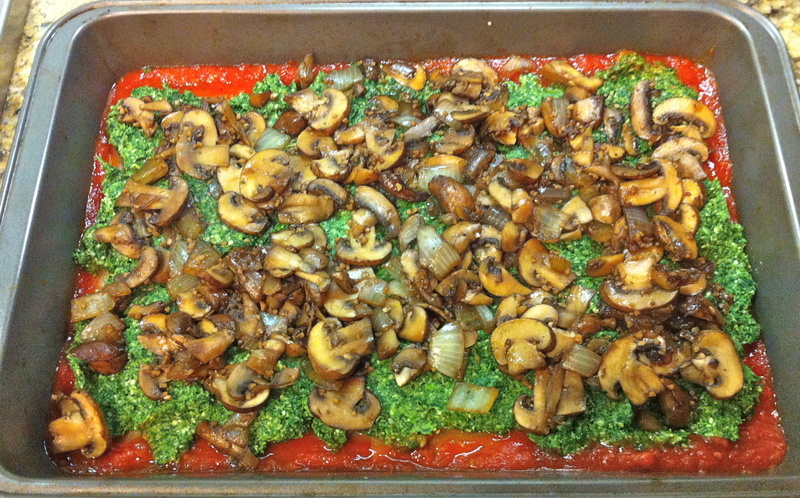 Then put a layer using about 1/2 mushroom mixture. 8) Repeat: 1 layer of noodles, 1/3 spinach mixture, 1/2 mushroom mixture. 9) Place 1 more layer of noodles. Layer the remaining spinach mixture on top. 10) Smother evenly with 3 cups of marinara sauce, making sure that all the noodles are completely covered in sauce. 12) Bake uncovered in pre-heated oven at 375 degrees for 1 hour. 13) Let stand 10 minutes before slicing. 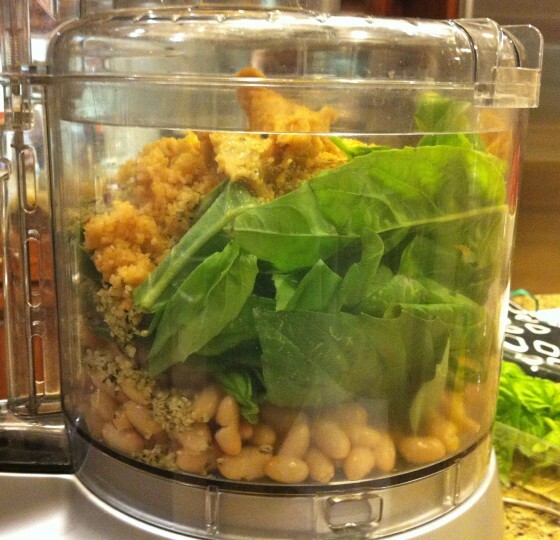 In a food processor, combine all ingredients until a powered texture is formed. Can be stored in the refrigerator for future use. 1) For gluten-free lasagna: replace the noodles with gluten free lasagna or rice noodles, or bake thin slices of eggplant for 20 minutes first and use in place of noodles. 2) Instead of beans, extra firm tofu can be used. 3) Instead of frozen spinach, frozen kale can be used. 4) Sliced black olives can be sprinkled on top before baking. 5) Instead of hemp seeds or cashews, pine nuts can be used. 6) Refrigerated leftovers slice more cleanly than when the lasagna is hot. Easy Vegan Pesto Sauce : It Goes On Everything! This looks amazing, Ellen! I love Chef AJ’s recipes. Her “Hail To The Kale” salad is one of my staples. Now I have another one! It really is very delicious! Looks like a great dish Ellen! Let me know when you try it out!! 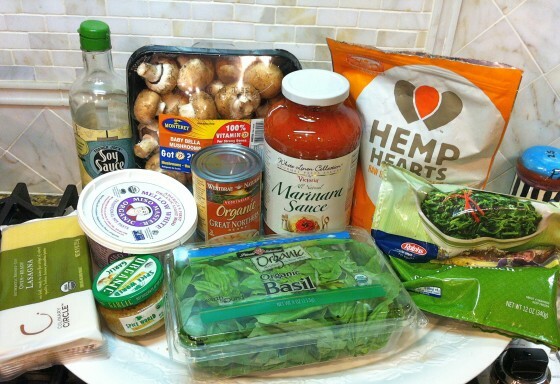 Is that Khloe and Lamar (as in Kardashian) marinara sauce I spot in your photo of ingredients? Are they in the tomato sauce business also? Wow!!!!!! I’m impressed!!! Got any left? Now that is one impressive stack of pasta goodness! I’ve only made a few lasagnas, always very traditional with just tomato sauce and tofu ricotta, so I’d love to branch out try your version. Can’t go wrong with mushrooms- Sounds fantastic! I would love to hear how it comes out! Please let us know! I made this Lasagna last night for dinner and it was FANTASTIC!!!! I did not have miso paste and I thought it may need some extra flavor so I cheated and used some parmesan cheese (I am not vegan). This was SO delicious I did not miss the meat at all!!! I am definitely going to make this again, and Ill get miso paste for the next time and follow the recipe exactly. 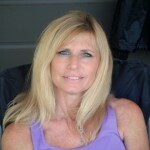 Thanks Ellen and Debby!!! This particular lasagna recipe is a “winner!” I make this all the time. Thanks for the comment! Just want you both to know that Andrew has specifically requested this dish for Rosh Hashanah dinner! I know it is not at all traditional, but I’m going to make it for fear Andrew won’t come home for the holidays if I DON’T make it! Happy New Year VAPs!